“The Daily Voluntaryist, Vol. 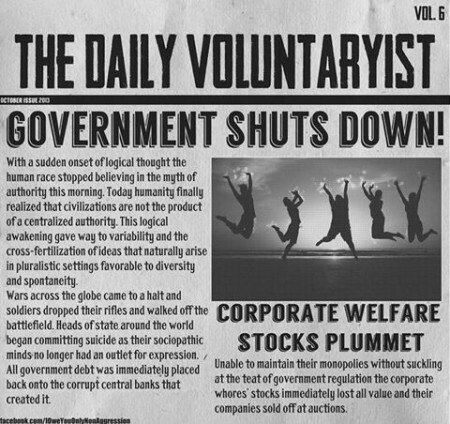 6 – Government Shuts Down! With the sudden onset of logical thought, the human race stopped believing in the myth of authority this morning. Today, humanity finally realized that civilizations are not the product of a centralized authority. This logical awakening gave way to variability and the cross-fertilization of ideas that naturally arise in pluralistic settings favorable to diversity and spontaneity. Daniel Sv. : If anarchy does descend, I hope you have a nice farm in North Carolina that I can take refuge in and work on. Daniel Sv. : Make sure though it’s near a university town, has a huge library or Barnes and Noble, and has no cotton. I will pick tobacco, but no cotton! 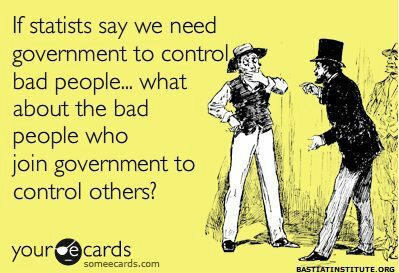 Reject Centralized Government As Inherently Criminal! My Commentary: The centralized governments of the world empower the same criminals they claim to protect their citizens from. These predators, in turn, legalize their criminality, while criminalizing our humanity. And, apparently, as we attempt to destroy this parasitic relationship using the poison of TYRANNY, it only adapts to the new environments we create for it, while we weaken ourselves for an even worse infection! Now is the time for us to use the elixir of true FREEDOM to heal and rid ourselves of this Beast system! Let the way we live actually reflect reality, with EVERY Individual speaking in their own unique voice! Embrace the EQUALITY and JUSTICE of Individual Sovereignty, which logically, peacefully demands our adherence to the The Non-Aggression Principle, and opens the door to Voluntaryism!